The Harriers go into their first cup action of the season tomorrow when they take on Vauxhall Motors and also try to get back to looking something like the Harriers that we are all yearning for. In the past few weeks, just after this crop of injuries started to take a grip, we have looked a very poor side and the poor results are starting to bring calls from some quarters for, at the least, a change in management style or in more extreme circumstances a call for the head of Mark Yates. It's doubtful if he would fall on the sword if we made an early exit from the FA Cup but it certainly wouldn't help matters. We all know that the cup can be a great leveler and this was indeed the case when we played this very team in the early stages of last seasons FA Trophy. 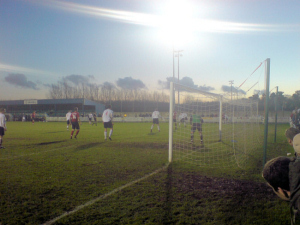 In the first game at Aggborough we threw away a 3-0 lead for them to equalise in the final seconds and end the game all square at four goals apiece. Thankfully James Constable 'did the biz' at the Motormen's Rivacre Park with a hat trick in our 4-0 win. Sadly Beano won't be available tomorrow after doing his hamstring at Histon and will be out for a couple more weeks yet. Scott Bevan is also still missing and this week his loan replacement, Chris MacKenzie, agreed to stay with us for a further month. Jeff Kenna has now undergone his hernia op' and will be out for at least another month while Simon Russell has also been missing for most of the season so far with various complaints and will miss this game too. We do still have some players though and will have Mark Creighton back after his enforced missed game following the sending off at Histon. Iyseden Christie should be available too after coming on in the second half of last Saturdays defeat against Weymouth. It's going to be interesting to see if Christie will get his first start of the season or wether Mark Yates will stick with Matt Barnes-Homer after his decent performance against Weymouth. Vauxhall, as last year, are again an unknown quantity with no idea who is out injured or even who still plays for them. Their pants website hasn't even told their fans that they have an important FA Cup game this week and so don't be surprised if the don't turn up. It is known that they have been through some changes in management last week with former manager Carl Macauley stepping down to let the assistant manager Andy Mutch take over the reins. They also have a striker that is attracting interest from other clubs in Paul Taylor due to his prolific scoring rate. He won't get a look in against us though. It's obvious that we need to dispose of Vauxhall first time round this time. We just do not want a replay in fogbound Merseyside again. Coleman, MacKenzie, Harkness, Bignot, Creighton, Whitehead, Munday, McGrath, Ferrell, Bennett, Hurren, Penn, Richards, Blackwood, Barnes-Homer, Smikle, Christie.